I can’t believe I didn’t try this earlier! This is so simple and so great! I tried it with 1st, 2nd and 3rd grade and they loved it! They could have played it the whole 45 minutes! I thought 3rd graders would be too ”old” for it, but they’re not. 4th graders probably are, haven’t tried it with them yet. 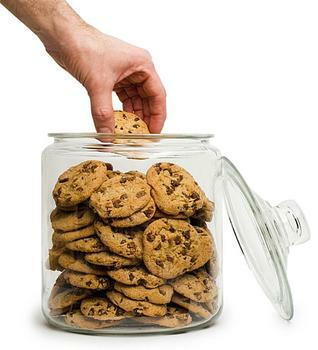 Everybody: Who stole/took the cookie from the cookie jar? Ivan stole/took the cookie from the cookie jar! P: Not me!/ Couldn’t be! The pupil then nominates someone and so on. I even sewn a little cookie which they love. I think next time I’ll adopt it for when we learn food. I’ll show a pic of a food we’re looking for (e.g. carrot) and the text would go: Who stole the carrot from the fridge? You just have to sing it so it would fit the rhythm, but it could work! Haven’t posted about English in a long time, but I came across a good exercise for children to see the difference between the use of Present Simple and Present Continuous. There is always a problem with that. They learn everything in PC from the first grade. They are so used to it that when PS is finally introduced they are confused (especially because in Croatian you translate it the same). I took this idea from a collegue that theaches in higher grades (from 5th and 8th) and she said it was great for them. A bit confusing in the beginning, but once they got the hang of it and understood really why and when you use which tense, it is great. I tried it in the 2nd and 3rd grade and I’m really happy how it turned out. Here is how it goes! You don’t need anything. You just have to stand in front od the class and you tell them sentences using PS and PC. They answer only with YES, NO or MAYBE. I’m jumping (you do jump). Yes. I drink coffee. Maybe (Because they don’t know the truth if you really drink it or not). 1. First I start with PC only and I put NOW at the end od the sentence (I’m jumping now.) to emphasise that PC is only for action that are happening right now. 2. Next, I stay with PC, but I tell them actions which are not true. I tell them I’m jumping, but I’m actually standing. So the answer is No. When they see the difference between those two situations, I put PS in. 3. Add PS sentences. They will answer everything with yes at first, but they will quickly understand. Put same sentences one after another like the one I wrote above with the coffee (so the same sentence, but one in PC and one in PS). Do this a couple of times. They will see the diffrence. 4. Of course, take a minute and ask them why they answer something yes and sometnig no. There will always be one child who understands that PC is for NOW and PS is for something in GENERAL. When we get to this point, I always ask them to explain that. They will repeat the rule a lot and remember it. And that’s it! Hope you understood me?! I was really surprised and happy when I saw how quickly they caught on! I will spend a couple od minutes on it from time to time just to make sure they don’t forget it. Do you have the same problems with PC and PS? How do you deal with it? Finally Friday! 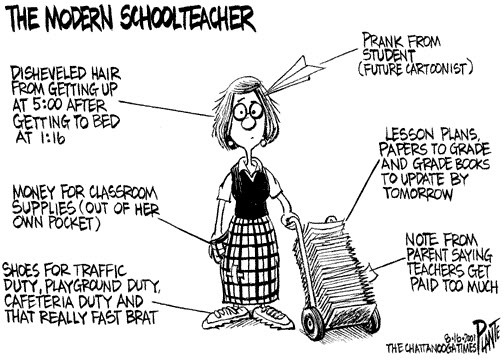 =D I don’t think any other profession looks forward to that day like teachers! Here are a few games that have worked for me really well when I have a few extra minutes. You need 2 pupils. They face each other and hold their hand at their sides (like guns). You ask them: How do you say ____ (word in your mother tongue)?. They have to translate the word into English while ”shooting their guns” (hands of course ;)). The one who is faster and says the correct word wins. The other pupil who got shot goes back to their seat and someone else comes. You can also have them translate into the mother tongue. I don’t know what to call it so it is as good of a name as any. Draw a cloud on the board and have children tell you any letters. Write them into the cloud. Decide on how many letters you will write and don’t forget about vowels. Put them into groups and give them a time limit (2-3 min). They have to find as many words as they can in that time. Make up a pointing system (e.g. 1 point if all of the groups have the word, 2 points if only one group has it). Group with most points win. There are two groups. Draw 2 stick men on the board (one for each group). A pupil from each team comes to the board. Give them a word to write/spell (however you want to play it). I usually have them both write it and then spell it. If it is correct, they get to erase a part of the body form other team’s stick man (a head, neck, leg, arm…). Winner is the team who erases the whole stick man of the other team… thus the invisible man. They love erasing their opponent’s stick man! However, this takes a lot of time. If you want to shorten it, draw something else which has a lot less thing to erase. That’s it for now. There are more, but for some other time (I will probably rewrite this post and just add the games on). Let me know how it turns out for you or if you have any other games, ideas or adaptations. This is something I’ve been doing lately that has worked from the 1st to the 4th grade. They love it! And it is so simple! I stand in front of the class with my FCs and turn them so I can’t see them, but they can. I mix them and they say when to stop. Now the guessing starts. Depending on how many FCs you’ve got, decide how many tries you will have. I usually have 5 tries in which I have to guess what’s on the FC. I ask, they answer as a class and if I don’t guess after all of my tries I call out one pupil to give me the correct answer (insist on full sentences). Class: Yes, it is./ No, it isn’t. T: Have I got toy soldiers? C: Yes, you have./ No, you haven’t. After some time, a pupil comes in front of the class to take the teacher’s place. Everyone wants to come and guess! Even the children who usually try to hide and aren’t the best in English want to play this (at least that’s what happened to me for which I am thankful. Some children have finally woken up). You can adapt this game to your needs. If you want to practice plural, we, just bring out two pupils and have them ask questions in turns (Have we got..?). If you want to practice he or she, just tell them they are answering for someone else. Make up a character. They love imagining things. I usually use this time to check their homework if they had to write something in their notebooks. Next week I’m practicing physical descriptions, can/can’t and have got/haven’t got with the 4th graders. I plan on playing Guess who? First, I’ll have them write names of famous people on pieces of paper (because I have no idea who is famous with them these days except Justin Bieber, One Direction and Big Time Rush. Guess I’m getting old X)). One Pupil is going to sit in front of the blackboard and I’ll write the name of the famous person above their head and they’ll have to guess who they are by asking questions and the rest will have to give short answers. Am I tall/short/old/young…? Yes, you are./ No, you’re not. Can I sing/dance/cook…? Yes, you can./ No, you can’t. Have I got long/short hair…) Yes, you have. No, you haven’t. If you want to practice questions with he or she, just tell them to guess the person and not to pretend they are the person. Only one student knows who or they can ask you. And that’s it! Let me know how it turns out for you or if you have any other games you use in your classroom!